Grant us, O Lord, we pray, that the course of our world may be directed by your peaceful rule and that your Church may rejoice, untroubled in her devotion. Through our Lord Jesus Christ, your Son, who lives and reigns with you in the unity of the Holy Spirit, one God, for ever and ever. 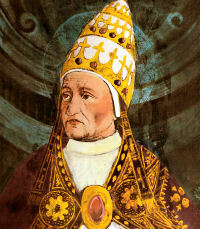 Today is the feast of Pope St. Felix I, who governed the Church from 268 to 273. St. Felix I was buried in the "crypt of the popes," in the catacomb of St. Callixtus, and is often confused with the second century martyr St. Felix, a victim of persecution under the Emperor Marcus Aurelius. Also it is the feast of St. Joan of Arc (some places), Patron saint of France. In her day, the English were allied with the Burgundians in a war against the rest of France. Joan was compelled by voices of her favorite saints to take up arms in defence of her country. Dressed in a suit of white armor, she led the French in battle against the English, who retreated, believing that she was in league with the devil. She continued to battle against the English, with dwindling support, until she was eventually captured and tried as a witch. She was found guilty and at the scaffold she pleaded guilty in exchange for a pardon from the Church. However, since the English had no intention of releasing her from prison, she quickly renounced her confession and resumed wearing men's clothing. For this they publicly burned her at the stake for witchcraft and heresy. The Church reversed its decision in 1455, and she was canonized in 1920. The son of Constantius, Felix was a Roman by birth. He was elected to the papacy shortly after the death of St. Dionysius. It was Felix who received the letter from the Asiatic bishops announcing the deposition of Bishop Paul of Antioch, Dionysius having died before its arrival. Felix was also informed of the election of Domnus I to replace the deposed heretic. Unfortunately, Paul refused to vacate the church building and denied entrance to the newly appointed Domnus. Emperor Aurelian, who then sat on the throne, happened to be passing through Antioch when he was asked to intervene in the matter. Aurelian ordered the see to be turned over to whichever bishop was in true communication with the bishops of Italy and Rome. At long last, Paul was forced to make an undignified exit, while Timaeus, Domnus' successor, was able to take his rightful place among his flock. Felix is said to have ordained that the celebration of Mass take place over the graves of martyrs. Although Felix reigned for nearly six years, little else is know of his pontificate, except that it was free from persecution. Felix died in December and was buried in the papal crypt located in the cemetery of Calixtus. His feast is kept on May 30. 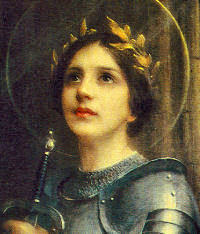 Saint Joan was born on January 6, 1412, in the village of Domremy to Jacques and Isabelle d'Arc. Joan was the youngest of their five children. While growing up among the fields and pastures of her village, she was called Jeannette but when she entered into her mission, her name was changed to Jeanne, la Pucelle, or Joan, the Maid. As a child she was taught domestic skills as well as her religion by her mother. Joan would later say, "As for spinning and sewing, I fear no woman in Rouen." And again, "It was my mother alone who taught me the 'Our Father' and 'Hail Mary' and the 'Creed;' and from none other was I taught my faith." From her earliest of years Joan was known for her obedience to her parents, religious fervor, goodness, unselfish generosity and kindness toward her neighbors. Simonin Munier, one of Joan's childhood friends, tells how Joan had nursed him back to health when he was sick. Some of her playmates teased her for being 'too pious.' Others remembered how she would give up her bed to the homeless stranger who came to her father's door asking for shelter. Joan was 'like all the others' in her village until her thirteenth year. "When I was about thirteen, I received revelation from Our Lord by a voice which told me to be good and attend church often and that God would help me." She stated that her 'Voices' were Saint Michael the Archangel, Saint Catherine and Saint Margaret. At first her 'Voices' came to her two or three times a week but as the time for her mission drew near (five years later), they visited her daily telling her to 'Go into France' to raise the siege of Orleans, conduct the Dauphin Charles to Reims for his crowning and to drive the English from the land. Joan went to the neighboring town of Vaucouleurs, which means Valley of many colors. There she spoke to the loyal French governor by the name of Sir Robert de Baudricourt. After many rejections he finally agreed to send her to the Dauphin who at the time was living at the castle of Chinon. On the evening of February 23, 1429, she began her mission for God. In the company of six men, she rode through the Gate of France on her way to Chinon. Joan reached this town on March 6th, but was not received by the Dauphin, Charles, until the evening of March 9th. After being accepted and approved by a Church council headed by the Archbishop of Reims, Joan was allowed to lead the Dauphin's army. This part of her career was meteoric. She entered Orleans on the evening of April 29th and by May 8th the city had been freed. The Loire campaign started on June 9th and by June 19th the English were driven out of the Loire valley. The march to Reims started on June 29th and by July 17th Charles was crowned King of France in the cathedral of Reims. From this time on, for reasons know only to King Charles, the king no longer valued Joan's advice and guidance. She had always told him that God had given her 'a year and a little longer' to accomplish His will but the king seemed to take no notice of it. For almost a year he wasted what time remained to Joan, until in frustration, she left the court. Her last campaign lasted from the middle of March until her capture at the town of Compiegne on May 23rd, 1430. Her 'year and a little longer' was over. Abandoned by her king and friends, she started her year of captivity. As a prisoner of the Burgundians she was treated fairly but that all changed when on November 21st, 1430, she was handed over the English. How she survived their harsh treatment of her is a miracle in itself. The English not only wanted to kill Joan but they also wanted to discredit King Charles as a false king by having Joan condemned by the Church as a witch and a heretic. To obtain this goal the English used those Church authorities whom they knew to be favorable to them and the staunchest of these was Bishop Cauchon. Joan's trial of condemnation lasted from February 21st until May 23rd. She was finally burnt at the stake in Rouen's market square on May 30th, 1431. Twenty-five years later the findings of Joan's first trial were overturned and declared 'null and void' by another Church court, who this time was favorable to King Charles. It was not until 1920 that the Church of Rome officially declared Joan to be a saint. Her feast day is celebrated on May 30th. Visit the St. Joan of Arc Center for more information.